In terms of quality and originality, Bhutanese architecture is without doubt one of the best expression of country’s unique character. Almost completely isolated for many centuries by its complex geography, Bhutan has indeed seen very few changes in its architectural system since the earliest times. The main roots of its architecture goes to Tibet, which was itself in relation with China and faraway Persia thanks to traders travelling on silk route. Drawing inspiration from older forms and ideas, the architects of Bhutan developed a style which is peculiar to their own country. Displaying a great sense of innovation, they made each dzong, temple and monastery a unique creation, different from all others but at the same time maintaining a perfect unity of architectural style throughout the country. Each of these buildings was designed and built to harmonize with the environment and fulfill certain specific functions and many of them are true master pieces. The great fortresses known as ‘dzongs’ are among the most striking example of Bhutanese architecture. Rising proudly at strategic places, at the entrance to the valley, at the summit of a hill or at the confluence of two rivers, dzongs are built on a grand scale without the help of any drawings and held without a single nail and are outstanding examples of the best in Bhutanese architecture. Reflecting a certain view of religion, society and spatial organization, the dzongs symbolize the history and long independence of Bhutan. Bhutanese Goembas (monasteries) can be divided in two types :- ‘Cluster type’ which consists of a core formed by one or two temples with various dwelling structures grouped around such as Dzongdrakha in Paro valley , Phajoding in Thimphu valley and Tharpaling in the Bumthang valley. The second category ‘Dzong type’ is built like fortress with the central tower enclosing the temple and surrounded by exterior walls against which are built monks cells and service rooms. The most impressive example of dzong type goembas are monastery of Gangtey and Tango in upper Thimphu valley. The influence of Tantric Buddhism since the mid 7th century has irrevocably shaped Kingdom’s history and destiny, and has had an indelible and enlightening impact on the Bhutanese way of life. It affect almost everything ; from arts and crafts to the system of government, from folk dances to architectural style. To this day also, the importance and relevance of Buddhism has not waned and Buddhist values and traditions still permeates every aspect of the Bhutanese culture and ethos. At different time of the year, the annual festivals known as “Tsechus” take place in different locations. These Tsechus are festivals extolling the great deeds of Guru Padsambhava also known as Guru Rinpoche. Festivals are celebrated for several days between three to five and are the occasion for dances that are purely defined in religious content. Dancers in brilliant silk costumes re-enact legendary events, accompanied by blaring horns, booming drums and clashing cymbals as they whirl and leap against a background of sky and mountains. Certain festivals end with the unveiling and worship of a huge religious appliques or thongdroel and festival goers believe that simply by viewing this thangkha, they can be delivered from the cycle of reincarnation which is the ultimate aim of Buddhism. The country’s primary dance form is the classical lama dancing. All of the dances are religious and symbolize destruction of evil spirits. The most important festival dances, celebrate the faith, legends, myths and history of the Kingdom and are important religious and social gatherings. Among Bhutan’s many hidden treasures is a magical mosaic of rich, vibrant hues and patterns, in myriad weaves. The weaves that have today become vivid symbols of the Dragon Kingdom. The National dress of Bhutan is one of the most distinctive and visible aspects of Dragon Kingdom’s unique character. Men wear Gho, a long robe similar to Tibetan Chhuba while women wear, ankle length robe called Kira. The Bhutanese textile is made from fine, hand-woven fabric, with the colourful distinctive patterns. Formal occasions, require men to wear a scarf called Kabney that also indicates person’s rank. 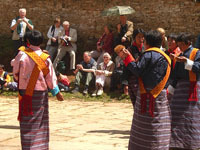 Wearing Kabney is an important part of Bhutanese etiquette. In same manner women wear rachu over their left shoulder on all formal occasions.